Fiber Antics by Veronica: Taking time for "Slow Quilting"
While the early October weather is blissfully pleasant outside and there is still daylight after the work day, take a break from the machines (sewing and computing) and relax with some hand piecing... no wi-fi, chargers or electrical cords required! Hexagons, or "hexies" are so in vogue these days. Remember the Grandmother's Flower Garden pattern? This is it all over again—but with fresh, new fabric prints. 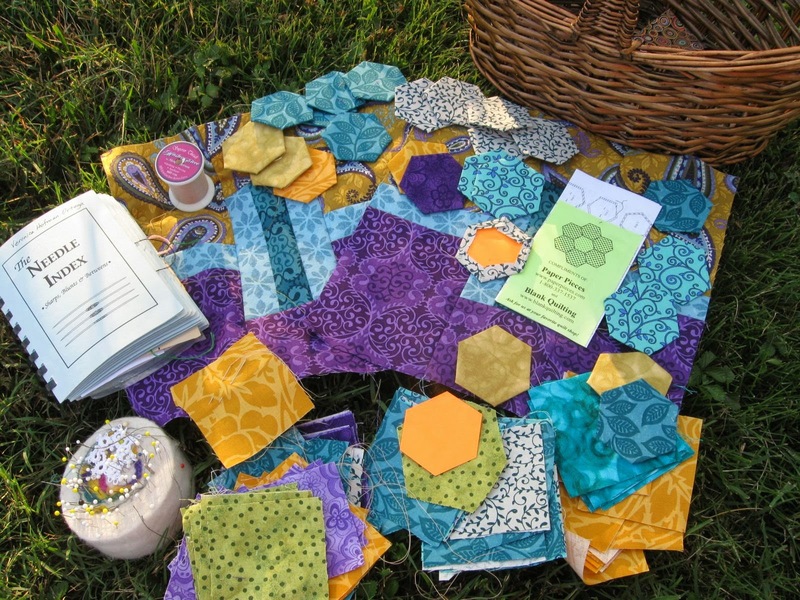 These hexie bits are going to be part of my Samsara quilt project. Contemporary fabrics + English paper piecing = Slow Quilting Fun! For most quilters, quilting is as much about the process as it is about the project. So, savor every stitch with English paper piecing and get your retro groove on with a few hexies... and a little slow quilting. Note: You can get the hexagon paper templates at Paper Pieces [www.paperpieces.com] or plastic ones called Quilt Patis.